Amitabh Bachchan can make faces: fact. 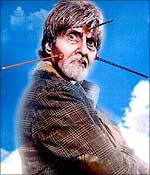 We've grown up watching Bachchan do a lot in his own inimitable way, and funny faces -- be it as a drunkard, an English-ignorant bumpkin, or a paan-chewing inspector -- have been a large part of that repertoire. Therefore, while it is more than a trifle saddening to see him in roles that really demand nothing more than a perfunctory performance -- and standard issue face-pulling -- the makers of Bhootnath can at least rest assured that they have the best actor for the part. They don't have much else, however. Vivek Sharma's directorial debut starts off 'sweetly' enough, and once you realise that Bhoothnath is a kids' film that isn't even trying to be anything else, the unspectacular first half pretty much works. All is likeable enough right till the third act, where the movie abruptly and unapologetically turns into the kind of handkerchief-friendly melodrama-fest we have come to associate with BR Films of late. So we go from a movie only for kids to a movie that kids wouldn't watch unless they were bribed with action figures. Sigh. The film's leading lad is a natural enough young fellow called Aman Siddiqui, who plays local mischief-maker Banku. Shah Rukh Khan [Images] and Juhi Chawla [Images] play his parents, who have just rented a Goa [Images] bungalow, and while Daddy dear works on a cruise liner, Mommy has her hands full force-feeding Banku breakfast and unpacking the furniture on her own because no bai would venture close to the place: it's haunted, you see. After many sets of lips wag about these haunted rumours of Nath Villa, Banku confronts his mother with The Ghost Question. There are no ghosts, she says, before filling his head with some good-natured malarkey about angels. Sure enough, Banku comes face to face with a ghost and stoically refuses to accept it. (Between rationale and what ma says, the latter wins, every time). The rest of the film is predictably about this kid and the dynamic he develops with this ghost, with this angel who needs a manicure. 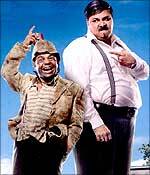 And while there is absolutely nothing you haven't seen before in innumerable films like Blackbeard's Ghost -- and a gag involving school principal Satish Shah is even borrowed from Bruce Almighty -- both Grizzled Old Ghost and Easily-Angered Young Man play their parts with warmth and gusto and, in Bachchan's case, even grace. Be warned, however, those over 10. These are times when we're used to geniuses taking on children's films, like Tim Burton and Vishal Bhardwaj or those marvellous Pixar maniacs, all ensuring there's enough in the story and the telling to keep non-children of every age involved. This, then, comes as a simpler, sillier film, one that doesn't have levels or in-jokes or references to more than is clearly evident. Not that there's anything wrong with that. The problems, as mentioned, arise in the film's third act, where we suddenly confront Bachchan's life, and flashbackingly start ruminating on not just his death, but delve into an entirely needless backstory involving his wife, his neglectful son and lots more claptrap -- 'from the makers of Baabul,' you see -- that all seems contrived because the director has realised that Priyanshu Chatterjee looks convincingly enough like a young Bachchan to play his son. In sum, Bhoothnath is more than a bit of a drag, despite the lead players trying hard to make it stick. The rest are just okay: Satish Shah makes white-bread sandwiches look yummy, Rajpal Yadav appears to be playing himself, a simpering Shah Rukh Khan looks like he's just bid Knight Riders players Brandon McCullum and Ricky Ponting [Images] goodbye, but it is Juhi Chawla -- that onetime mistress of misfits, an on-screen comedienne without compare -- whose performance ends up as the most laboured one, one that in conjunction with the film's abrupt heavy-handedness, lethally drags Bhoothnath's, um, spirit, down. Siddiqui himself is quite good, sparring amusingly with the old ghost and doing immensely well in the film's penultimate scene, on a rooftop. As for the ghost himself, here isn't much to say but that director Vivek Sharma is a lucky man: for Amitabh [Images] doesn't just pull a face, he often saves it. Or at least he tries.